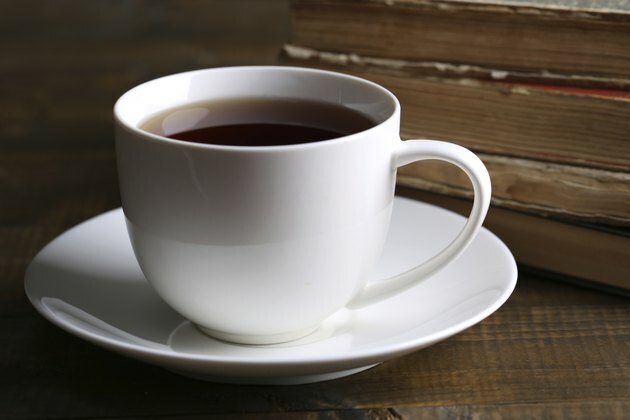 Tea, whether it's black, green, white or any other color, is a wise beverage choice because it offers numerous health benefits. But tea also contains tannins, which can be good for certain reasons, but the compounds aren't always beneficial. Teas contain different levels of tannins, depending on their color, and learning how to tell the difference will help you choose what tea, if any, belongs in your healthy eating plan. Tannins are polyphenols, compounds present in plant foods, that are responsible for the colors of many flowers and the astringent flavor of foods such as unripe fruit and tart red wine, according to Cornell University. Tannins also help proteins retain their molecular structure, Cornell University notes. This means that the proteins are able to function normally in your body. The exact amount of tannins in various types of tea varies depending on what color the tea is and how long it was steeped before drinking it. Fresh leaf tea contains more tannins than processed teas, according to Victor R. Preedy, author of "Tea in Health and Disease Prevention." The color of tea influences tannins, too. White tea, for example, has fewer tannins than black tea, according to the Pacific College of Oriental Medicine. Lightly fermented oolong tea, which is darker than white tea, is also a good source of tannins, Preedy notes. Green tea is among the teas with the highest amount of tannins, according to Preedy. Along with other polyphenols in green tea, tannins might contribute to the health benefits of green tea. The University of Maryland Medical Center notes that drinking green tea can help lower cholesterol and reduce the risk of heart disease and certain types of cancer. There is evidence that drinking tea of any color reduces your risk of certain health problems, according to Maurice Edward Shils and Moshe Shike, authors of "Modern Nutrition in Health and Disease." Tannins, however, are also associated with increased risk of blood clotting and liver necrosis, Shils and Shike report, though the exact amount that would be harmful would depend on your personal health history. Tannins, sometimes even in small doses, can also interfere with digestion and can inhibit the normal absorption of certain nutrients, such as iron, so always talk to your doctor about the risks and benefits of tea if you have a pre-existing health problem. What Are the Health Benefits of Ceylon Tea?